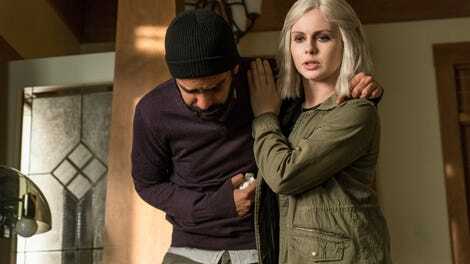 What a difference a murder makes—or, in the case of this episode of iZombie, the lack of one. For the first time this season, there was no murder case for Liv and Clive to solve and the result was an episode with room to breathe and, most importantly, explore Liv’s new quest to become the new Renegade. This isn’t meant to disparage the murder cases, which are typically a great way to incorporate the show’s more comedic elements via Liv’s brain personality of the week. But once in a while it is very refreshing for the writers to get a chance to have an A, B, and even C story that aren’t beholden to solving a case and can therefore be more about the characters. 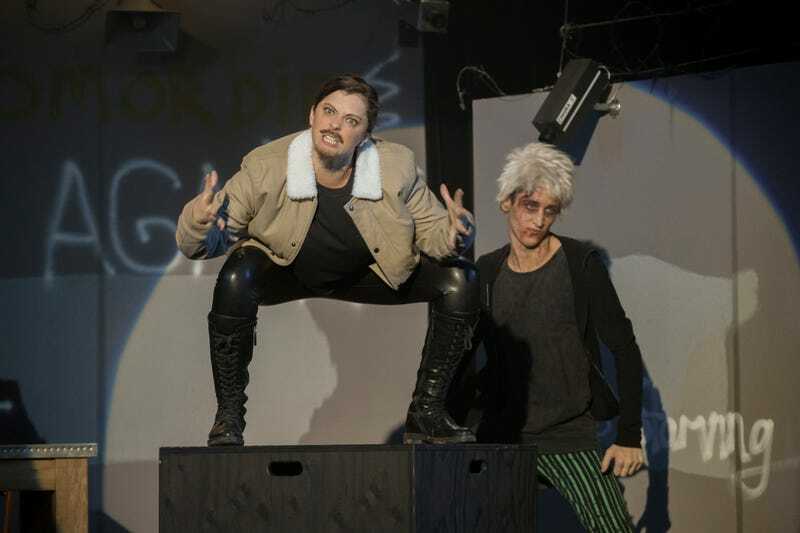 “My Really Fair Lady” kicks off with the most entertaining cold open of the season, with Rachel Bloom guest starring as a driven actress and director putting on a zombie version of Rent inside the walled city of Seattle. (I’ll never think of “Seasons Of Love” the same way again.) The only downside of Bloom’s appearance is that it is confined solely to the cold open since she was one of the victims of the bus crash Peyton was dealing with in a previous episode. This cold open exists mostly to set up Liv eating Bloom’s brains, and it’s a novelty that she’s doing it here simply out of hunger and not out of a need to get visions to solve a case. What we’re left with is a fun little runner where Liv periodically breaks out into song and is way too intense and theatrical about pretty much everything. Liv’s brain personality is much more subtle than it typically is but still helps to further her plot, as she meets up with Mama Leone’s team and attempts to get them to trust her to take over Mama’s place as Renegade. Mama’s death lead to the crumbling of her entire underground network, and this left a shipping crate of smuggled humans trapped in a loading dock with no way to escape. Liv’s theatrical brain leads her to orchestrate an entire caper to get them out, complete with her cohorts posing as truck drivers and a Fillmore Graves guard. The highlight of this sequence is Liv showing up to distract the security guard, posing as a stranded party girl. This allows Rose McIver to use her natural accent in the scene., and it’s a lot of fun and a nice nod to all of us who have been waiting for an excuse for Rose to go all New Zealand on a brain. Where Liv officially takes over Mama Leone’s operations and becomes Renegade, though, is when she scratches all of the smuggled humans who were sick, and does it while being recorded on camera. There is really no going back for her from this point forward, and it’s a big step that was really needed to up the stakes on this zombie Seattle story. This is something that has the potential to alter her relationship with almost every other character on the show—not to mention endanger her work, and the work of all her friends who have connections at the police station, the mayor’s office, and Fillmore Graves. It’s a knotty, complicated story, and one I relish seeing develop from here. The other big story in the episode is Ravi’s decision to eat the brain of a heroin addict in order to help Peyton find a lost dog. That is literally the story, and although it sounds pretty dumb and at times seems pretty dumb (seriously, Ravi, what were you thinking) it does allow for a lot of great interaction between Ravi and Peyton, which is really its ultimate goal. Its goal might also be to drive me crazy thinking about heroin withdrawal symptoms and which are in the brain versus which are actual, physical symptoms separate from the brain but that’s neither here nor there; by the end of the episode all of that hinting about Peyton still having feelings for Ravi turns out to be the truth. At least for now it appears they are back together, and it’s sweet, honestly, no matter how they got there. Ravi and Peyton should have nice things, at least sometimes. A murder-free episode also leaves room for a fully developed C story, and here it is Clive’s continued issues with his open relationship. Just when he thinks he has made progress by setting a date with new officer Michelle, she finds out about Dale and basically thinks Clive is a two-timing idiot. It’s only when Clive confesses his situation and, unbeknownst to him, Dale overhears his sad confession that the truth that his situation becomes critical. This is exactly the kind of story that would typically not have time to exist in an episode with a traditional murder case, so it’s nice to see it here and give Clive something to play other than “officer frustrated with his silly partner.” Even when the show goes back to its typical format next week, as I presume it will, little breaks like these where the show gets to stretch its proverbial legs and shake out the routine are good for its long-term health, and for us as the audience. How did Blaine not know his dad had escaped the well? Is it really that dark down there? Blaine is a criminal mastermind but also kind of a dolt sometimes. I am looking forward to Blaine and his father’s stories intersecting more in the coming episodes. Zombie Rent is so ridiculous and that’s what makes it perfect. 525,600 zombies to love! Nothing made me laugh more, though, than Liv asking Ravi if he was ready for the sexual harassment seminar while doing jazz hands. Of course Johnny Frost was doing a sexual harassment seminar to fulfill a community service requirement for being a sexual harasser. Of course. Once again, Liv screwed Major over by stealing his Fillmore Graves uniform to use in her caper. The guard who got hit over the head saw Major’s name on that uniform. No way does this not come back to haunt him, and therefore her. Veronica Mars guest star alert! It was great to see Francis Capra (Weevil/Eli Navarro) again, and I hope he’s also in future episodes with Liv’s Renegade story. Ravi calling his brain cravings his “monthlies” is incredible. Also incredible: Don E’s facial expressions while Angus’ cult was chanting. There are so many small, perfect things to love in this show.